Second snow day is the last to which we’re entitled. Next year there is only one snow day. We have the most recognized holidays in the US. Some districts are having classes on Saturday this year. National—Gun control story phenomenal. Students taking lead and shaming adults. Walkouts, march last Saturday very successful. Great issue but will be a long haul. Students recognize when elected officials do nothing and call them on it. Thanks all who made sure students were safe when they used their political voice. Spending—DeVos targeted funding for high poverty children, special education, community learning schools, and PD. Wanted to put it into “school choice.” Work done in spending package phenomenal. DeVos got no cuts and we got 6% increase, as did all her targeted areas. Thank Senator Schumer. This helps us this year. We won’t have to backfill from state and city. This is about coordinating activity, and that’s what Janus targets. DeVos thinks she can change work rules for unionized employees, but cannot. She tried to unilaterally issue a “collective bargaining agreement.” This was stopped. Lobby Day—over 1100 people, NAACP, had great feedback. W. Virginia and Oklahoma—Believe Oklahoma will settle this week. These and other “right to work” states have no collective bargaining rights. Teachers in these states have nothing to lose. Haven’t gotten raises in years, benefits taken away more and more. Didn’t care about consequences, were ready to leave state. These are AFT states but wildcat strikes. Janus wants us all in same position, so we have nothing left and nothing matters anymore. We will not let them do that to us. These won’t be last two states. Oklahoma recognized they had to do something. State—Budget still going on. Our lobbying and strategy should work, especially with feds. Nothing in policy we are fighting against. We need to deal with moratorium sunset next year. GOP Senate will give money to charters while Assembly will give to teacher learning centers. Movement to stop Yeshivas from being audited to give proper education by Simkah Felder. Some Yeshivas opposed, saying they teach appropriate material already. If education aid is done correctly, we have to look at tax code. If we don’t change it, we will have huge hole in state budget next year. We will pay for services in states that don’t tax. New chancellor comes in on Monday, Richard Carranza. Will try to meet with him. Priorities are—we like policies, each other, but people in between not so much. If they aren’t here to help school, we don’t need them. Too many lawyers. We win because lawyers are morons. There’s also money. We lobby. DOE doesn’t stand with us. Mayor goes. It’s sad, when we’ve had close to 4 billion increase. We don’t see it in our schools. How much longer can we count on DeVos making mistakes? Chancellor needs to know work force doesn’t feel respected by DOE, and we have all this money that doesn’t get to schools. We believe teacher evaluation is the way to have people stay in this profession and understand how tough the work we do every day is. We don’t think DOE understands. Congratulates schools that have fought off closures. Still, many schools have fewer than 100 kids, remnant from Bloomberg. Negotiations—congratulates nurses and NYU Brooklyn, New Visions charters, and providers. Our negotiations—April 16 next meeting. Negotiating committee directing where we go. 400 people on committee. Every chapter represented. Surveys helpful. We have a clear understanding of what people think is important. After break, we will push for incident reporting. You have a right to report incidents. Can do it on UFT website. When you have discipline issues school culture not in right place. Safety and discipline is an issue. Principal said he got in trouble for reporting incidents, but now has fewer. Has a positive learning collaborative, swears by our program. Did anyone get a letter saying you had no incidents in your school? We can’t have hundreds of schools that haven’t had an incident. If that’s the case no one is in your school. We have to call BS and report incidents. Door knocking over 21K. We have 8,000 activists participating in membership teams. SBO season here. Don’t do SBOs if you complained about principal all year. This is our process. CL elections will take place in May and June. Asking that you do them as early as possible. Would like that settled and done with before Janus. If you are running, you may not be on election committee. Janus—Doing research now. Clear that attacks have already started. People have tried to hack our communications systems, set up Twitter in my name. In NYC, NY State, NJ, we had 17 incursions from people who posed as members and secretly taped union members and officials. Project Veritas is a group that does this. They smear unions and try to get teachers to drop union. We are taking legal action because they use false names. Illegal in NY. Freedom foundation most successful model for union busting. These are front groups. They FOIL and try to get union member info. They mail and knock doors, do paid media, social medial attacks. Funded by Koch, Broad, etc. We’ve been planning for two years. Manhattan Institute has a little money, but Empire Center has over 6 million from Kochs. Stated goal disrupt, destabilize, weaken UFT and NYSUT. Membership teams will ramp up. Educational campaign on Janus. We have tighter communication among members. 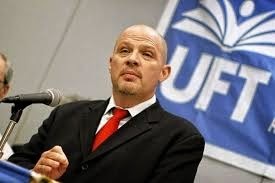 They want 20% drop in UFT membership. We won’t let it happen. We are at lowest # of agency fee payers in history of union. Could be everyone has to sign a card. We would have to use all summer to do that work. We assume we will have to get to each and every new teacher. Usually we take our time. We usually get 1500 last week of August and take time with thousands more. That will be gone. We will have to get to every one of them, at minimum. Working with DOE to try to get info in June. Fewer agency fee payers each and every week. We will have to deal with people saying give yourself a raise, quit union. Before next DA, every union member will get a card. Expiration dates short. Only sending to union members, not agency fee payers. We will also have a mobile app. Will have discounts on things. Building them. Stores coming to us, food chains, other things. Will go live at next DA. We know our people will be lied to. This is a part, but you cannot substitute for face to face conversation. People now thank me for home visits instead of calling the cops. Right to work people are coming to lie to you, as they’ve done in state after state. As for chancellor, we wanted an outsider. After getting rid of Bloomberg we got more bureaucracy. DOE can’t explain positions because they make no sense. Thanks us, wishes us great break and holiday. Says we have to have each other’s backs. LeRoy Barr—mentions March for Our Lives and our participation. Sent buses to DC. Student walkout. Had education forum, functional CL training. Sunday HERstory month celebration first annual. 4/11 wants us to wear blue, show solidarity for students with autism. 4/21, social studies teacher conference. Prom event great success last year. Doing it again all five boroughs. Next DA 4/18, wishes good holidays. Mulgrew—working with city council, will have to amp up family leave campaign. Hopes city council does hearing. CL CS 42—Thanks for support for CS 42. Has UFT considered contractual provision so CLs wouldn’t have to ask principals about Lobby Day or NYSUT? Mulgrew—Every year we have issues with AFT conference. NYSUT problems, let us know if you are elected. Some don’t want to go during testing. In Principal’s Weekly it said CLs released for Lobby Day. Would be up to negotiating committee. Q—Discrepancy between amount of work teachers in different schools do. Some places teachers seem like they are on vacation. A—Teachers need to work in environment they think best suits them. I taught AP classes. Was okay, kids were great, but not for me. Spent last 12 years working with average children in Brooklyn. We cannot look at other people and think they aren’t working at same level we are. I used to think little kids were easy, as HS teacher. Spent a day in elementary school, in first grade classroom, would never, ever do that. I can’t do it. Never seen anything like that. HS gives us breaks between class. Elementary exhausting. No idea how you do it. If someone doesn’t like setting they should transfer. We need to recognize we work differently. Need hazard pay depending on principal. Q—Bennett Fisher—Confused over family vs. parental leave. I see it mention in lit as parental. Are we fighting for family or only newborn children? A—I want both. No way to cost it so city wants crazy amount of money. State doesn’t qualify us for programs automatically. We need agreement of municipality. We don’t know where it’s going yet. Soon we will have data on what it costs. Doing parental, not giving up on family. Mayor could agree we have right to go into state program. You don’t stop, you keep trying. Their issue is they don’t want to cover classes. Moral question of whether you believe this or not. Governor agrees, believe it or not. Q—One objection to signing electronically if problem. Door knockers should have cards. Q—In order for us and functional chapter members to keep licenses we have to take courses. Some therapists have been denied use of these funds. A—Bring that to us. Admin sometimes automatically say no. Depends on situation. Probably problematic administrator. Need to show us why they do it. Q—Principal in our school says custodial budget cut. Will radically affect school. Said they may not have enough toilet paper for year. Principal will try to get CSA involved. Can UFT be involved. A—Heard of this this week. Part of our budget process, and frustration with DOE. Head counts of employees grow and we don’t have toilet paper. Place item for next meeting—Whereas DA is for elected reps to discuss, want 50% for motions questions and discussion. Have been attending for two years. Excited to hear reports. This is democratic body. We need more time to discuss and debate. Resolution to oppose, not endorse IDC. IDC prevents progressive legislation, Dream Act, Universal health care, more. Gives majority to GOP. Against—Paul Egan—Opposes because GOP is in power because of Simka Felder. IDC has been stopgap to having GOP run roughshod, has worked with us. This is internal Democratic Party fight. Need to flip Senate. Waste of time and money to fight now. Already a deal that if Dems get extra seat IDC will come back. Mike Loeb—Points out substitute resolution. Moves to amend and substitute resolution. Loeb—disproportionately suspends homeless, students of color. Resolution calls to expand pilots to all districts. Asks for educator voice in programs. Arm us with resources. Passes. I am not called on to speak against. No one speaks against this resolution, which was introduced by an E4E member. Janella Hinds—Speaks of MLK. Assassinated in Memphis. Supporting strike. 49 of those workers made whole only this week. Mel Aaronson—Speaks of UFT birthday. Says we have several people here who were here 58 years ago. Has them stand. At this point I walk out disgusted I was not able to address the resolution introduced by E4E members. I’m a great believer in unintended consequences. Of course I believe in safe and secure schools, but I question whether this will move us that way. In fact, I think it will have the effect of giving us fewer, rather than more options. Teaching is a demanding job, and we don’t make it any better by removing options from the teacher toolbox. We all know that principals don’t see things the way we do. They think the contract is a list of suggestions, they don’t understand the difference between three months or three years, and they have to call legal to have it explained to them. This would not be so bad if legal knew the difference, but of course they do not. Sometimes the city tells principals to report everything, Principals then go out of their way to report every time someone breaks a pencil, and pivotal community schools, like Jamaica, are closed. Then principals see schools closed, decide to report nothing, and chaos ensues. This, in fact, is mentioned in the resolution, and for all I know the reduction in reported incidents cited is a result of changes cited in the discipline code. I don’t see how this resolution helps make principals report more freely. Having fewer options will more likely push them toward reporting even less. Of course students should receive the most appropriate responses to whatever their actions may be, and if suspension isn’t called for, they shouldn’t receive it. However, when students offer to murder entire classes, I don’t want to be tied to an option of sending them to talk it out and have them return the next day to my class. Let’s move, if we need move at all, to place judgment in the hands of teachers. I’m sure we can all agree that teachers, in contrast to principals, tend not to be insane.I don’t know what they teach at principal schools but it most certainly isn’t logic. That’s our province, so let’s move options in our direction and keep them in our hands. Working teachers want and need more, not fewer options. Fort that reason, I urge you to vote no on this resolution.